If you’re reporting an issue on Buckinghamshire Council’s FixMyStreet installation, you might have seen yellow dots appearing on the map. These represent items such as streetlights, bins or drains, and we blogged about it when we first added the feature. 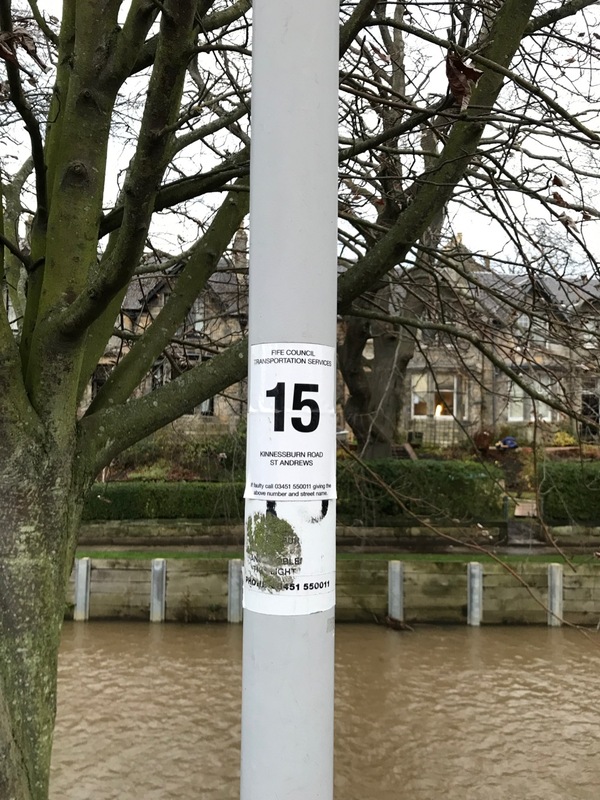 When it comes to assets like streetlights, it can save the council considerable time and effort if your report tells them precisely which light needs fixing: it’s far quicker to find an identified light than it is to follow well-meaning but perhaps vague descriptions like ‘opposite the school’! But even when the assets are marked on a map, it’s not always easy for a user to identify exactly which one they want to report, especially if they’ve gone home to make the report and they’re no longer standing right in front of it. After the system had been in place for a few weeks, the team at Buckinghamshire told us that users often weren’t pinpointing quite the right streetlight. So we thought a bit more about what could be done to encourage more accurate reports. The same functionality works for signs, Belisha beacons, bollards and traffic signals, as well as streetlights. Each of them has their own unique identifier. So, if you’re in Bucks and you want to make a report about any of these things, note down the ID number and compare it when you click on the asset. This means the correct information is sent through the first time — which, in turn, makes for a quicker fix. Win/win! This type of functionality is available to any council using FixMyStreet Pro: find out more here. Our client councils continue to test our integration mettle with the many and varied internal systems they use. One nice thing about FixMyStreet Pro, from the council point of view, is that it can play nicely with any internal council system, passing reports wherever they are needed and feeding updates back to the report-maker and onto the live site. What keeps life interesting is that there’s a huge variety of differing set-ups across every council, so there’s always something new to learn. Oxfordshire County Council are a case in point. They’ve been a client of ours since 2013, and back in May they asked if we could work with them to integrate their new highways asset maintenance system HIAMS, supplied by WDM, and make sure the whole kaboodle could work with FixMyStreet Pro as well. At the same time, they needed an update to their co-branded version of FixMyStreet to match a new design across the council website. FixMyStreet can take on any template so that it fits seamlessly into the rest of the site. As FixMyStreet was well embedded and citizens were already using it, it was vital to ensure that the disruption was kept to a minimum, both for report-makers and members of staff dealing with enquiries. 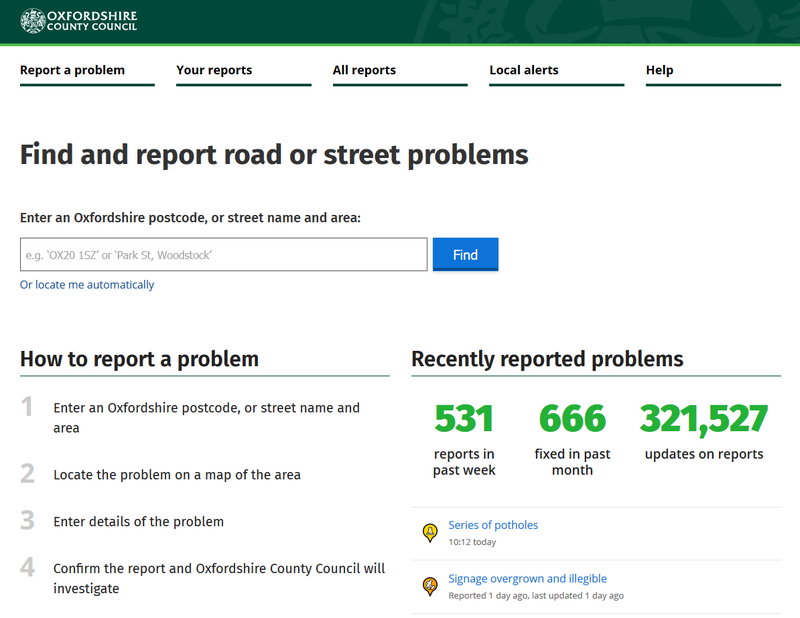 We worked closely with WDM and Oxfordshire County Council to create a connector that would pass information the user entered on Oxfordshire’s FixMyStreet installation or the national FixMyStreet website into the new WDM system, with the correct categories and details already completed. Once we saw data going into the system successfully, the next task was to get updates back out. One single report could take a long journey, being passed from WDM onto another system and then back through to WDM before an update came to the user. We didn’t want to leave the report-maker wondering what was happening, so it was crucial to ensure that updates came back to them as smoothly and quickly as possible. The integration between FixMyStreet and WDM is now live and working. Users will receive an update whenever their report’s status is changed within the WDM system, meaning there’s no need for them to follow up with a phone call or email — a win for both citizens and councils. “We’ve been using FixMyStreet Pro since 2013 as it’s a system which is easy to integrate and our customers love it. “From an IT support side; integrating the new system to FixMyStreet Pro was seamless. The team at mySociety have been a pleasure to work with, are extremely helpful, knowledgeable and organised. They make you feel like you are their top priority at all times, nothing was ever an issue. “Now that we have full integration with the new system, the process of updating our customers happens instantaneously. FixMyStreet Pro has also given us flexibility to change how we communicate with our customers, how often we communicate; and all in real time. As always, we’re delighted to hear such positive feedback. If you’re from a council and would like to explore the benefits FixMyStreet Pro could bring you, please do get in touch. One thing that’s not always talked about in tech is that sometimes projects take a few twists and turns before they find their final path. That’s certainly true of our Keep It In The Community project (KIITC) which aims to map Assets of Community Value across England, in collaboration with Power To Change and MHCLG. We’ve been blogging about the project as we progress, and if you read Mark’s blog in September you’ll have seen that we began with plans for a full central register, which would retrieve and keep in sync with information from council websites to present a countrywide overview of ACVs, and also allow community groups to register new ones. As we’d feared, we found that data from councils is in many varied formats, and is often moved around, meaning that getting the site to update automatically as we had first hoped would just be too difficult with the quite fragile approach of scraping and swapping spreadsheets that we had originally explored. And so we launched KIITC with a snapshot of the data as it existed in September 2018, all manually added by hand, and added functionality that would allow councils to maintain their own records if desired. Now, there’s another twist in the tale — we’re bringing some of our original vision back to the table. We’re planning some more development which will increase KIITC’s value for everyone: communities, citizens and councils alike. If councils don’t have the resources to maintain anything beyond the legally required bare bones register of assets, the community groups who care so passionately about the places and spaces they’re trying to secure will soon be able to get involved and help. This penny dropped when, in discussions with Locality, the national network supporting community groups, (and who are also funded by Power To Change) we determined that by working together more closely we could realise the ambition we have for KIITC to be a live up to date register of community assets of all types in England. With their collaboration, we’ll be able to talk to community groups to find out their needs, and then develop features for KIITC that will allow these groups to update existing ACVs and register new ones with details, photographs and stories. As part of that work in the next couple of months we’ll be adding the ability for anyone to update asset details on the site if they have more up to date information, and we’ll be improving how we display each asset to be more informative and attractive on the page. So watch this space as we work together on the latest twist in KIITC’s tail as we keep working on this over the next few months. Seen a pothole or a broken paving stone? Great, the council will want to know about that… well, usually. Buckinghamshire County Council’s version of FixMyStreet now shows where there are pending roadworks — alerting you to the fact that you may not need to make a report, because it’s already in hand. In general, councils appreciate your FixMyStreet reports: their inspectors can’t be everywhere, and often they won’t be aware of a problem until it’s reported. But there are some reports that won’t be quite so welcome. If the council is already aware of an issue, and in fact has already scheduled a repair, then sad to say but your report will be nothing more than a time-waster for both you and the council. Fortunately, there’s already a comprehensive service which collates and displays information on roadworks, road closures and diversions, traffic incidents and other disruptions affecting the UK road network, from a variety of sources — it’s called Roadworks.org. Just like FixMyStreet, Roadworks.org generates map-based data, so it correlates well with FixMyStreet. But we don’t want to clutter things up too much, so you’ll only be alerted to pending roadworks when you go to make a report near where maintenance is already scheduled. Of course, you can still go ahead and make your report if the roadworks have no bearing on it. We were able to integrate the Roadworks.org information like this because Buckinghamshire have opted for the fully-featured ‘Avenue’ version of FixMyStreet Pro. This allows the inclusion of asset layers (we’ve talked before about plotting assets such as trees, streetlights or bins on FixMyStreet) and the Roadworks.org data works in exactly the same way: we can just slot it in. We’re pleased with this integration: it’s going to save time for both residents and council staff in Buckinghamshire. And if you’re from another council and you would like to do the same, then please do feel free to drop us a line to talk about adopting FixMyStreet Pro. If you visit FixMyStreet and suddenly start seeing spots, don’t rush to your optician: it’s just another feature to help you, and the council, when you make a report. In our last two blog posts we announced Buckinghamshire and Bath & NE Somerset councils’ adoption of FixMyStreet Pro, and looked at how this integrated with existing council software. It’s the latter which has brought on this sudden rash. At the moment, you’ll only see such dots in areas where the council has adopted FixMyStreet Pro, and gone for the ‘asset locations’ option: take a look at the Bath & NE Somerset installation to see them in action. mySociety developer Struan explains all. Councils refer to ‘assets’; in layman’s language these are things like roads, streetlights, grit bins, dog poo bins and trees. These assets are normally stored in an asset management system that tracks problems, and once hooked up, FixMyStreet Pro can deposit users’ reports directly into that system. Most asset management systems will have an entry for each asset and probably some location data for them too. This means that we can plot them on a map, and we can also include details about the asset. When you make a report, for example a broken streetlight, you’ll be able to quickly and easily specify that precise light on the map, making things a faster for you. And there’s no need for the average citizen to ever know this, but we can then include the council’s internal ID for the streetlight in the report, which then also speeds things up for the council. The council will either have a map server with a set of asset layers on it that we can use, or they’ll provide us with files containing details of the assets and we’ll host them on our own map server. The map server then lets you ask for all the streetlights in an area and sends back some XML with a location for each streetlight and any associated data, such as the lamppost number. Each collection of objects is called a layer, mostly because that’s how mapping software uses them. It has a layer for the map and then adds any other features on top of this in layers. Will these dots clutter up the map for users who are trying to make a report about something else? With a bit of configuration in FixMyStreet, we associate report categories with asset layers so we only show the assets on the map when the relevant category is selected. We can also snap problem reports to any nearby asset which is handy for things like street lights as it doesn’t make sense to send a report about a broken street light with no associated light. We’re working to add data from roadworks.org, so that when a user clicks on a road we’ll be able to tell them if roadworks are happening in the near future, which might have a bearing on whether they want to report the problem — for example there’s no point in reporting a pothole if the whole road is due to be resurfaced the next week. Then we’ll also be looking at roads overseen by TfL. The issue with these is that while they are always within a council area, the council doesn’t have the responsibility of maintaining them, so we want to change where the report is going rather than just adding in more data. There’s also the added complication of things like “what if the issue is being reported on a council-maintained bridge that goes over a TFL road”. There’s always something to keep the FixMyStreet developers busy… we’ll make sure we keep you updated as these new innovations are added.